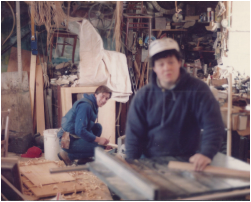 Elliott Morse and Greg Doak teamed up in August of 1976 as Morse and Doak Woodworkers. 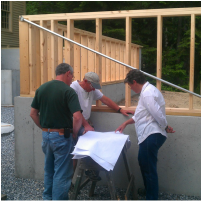 Both grew up in homes where their father’s included them on many home repair projects. Elliott’s dad loved antique clocks and was well known in the area as a good clock repairman and historian. 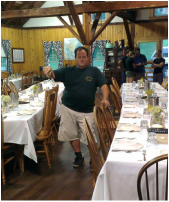 Greg’s dad was in the Windjammer business as a part owner of a 58’ wooden schooner built in 1902 and was the driving force in the construction of a 65’ Ferro cement schooner launched in 1975 at the site of Long Reach Shipyard in Bath. Elliott and Greg started doing mostly repair jobs with the abundance of older homes in the mid-coast area. They learned quickly about old doors, windows, moldings and sills. It was the end of the seventies when they first teamed up with David Leonard and the Kennebec Kitchen Company to do their first Kennebec Kitchen installation. This began a long and respectful relationship with the Kennebec Company that continues today. In 1980 Bryan Hayward was hired as a summertime employee. Bryan’s good work ethic and knowledge of repair work came from growing up working alongside his father, Frank, on the physical plant of Chop Point Camp and School located in Woolwich. He first worked for Morse and Doak Woodworkers part time and then became a full time employee through the 80's. 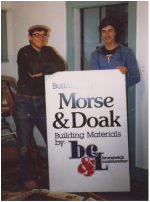 In 1991 the decision was made to incorporate as Morse and Doak Builders and it was at this time that Bryan became part of the ownership group. The latest big change occurred in 2016 as Greg decided to "semi-retire" and pass down his ownership responsibilities to his two sons Darius and Nathanael. We continue to grow with the core ownership group of Elliott, Bryan, Darius and Nathanael leading the pack with a great group of full time employees. We hope that our future history will include a project working with you.